There are new roads and less traveled roads. When you return to your childhood hometown to raise your own child after living in an entirely different state and major city for almost a decade, the idea of new roads and less familiar roads would seem almost impossible. The roads here are not really new for me and yet every one is different now. Among the friends that enjoy cycling with me, there is a common route that we often ride together. We ride out to the small town of Collinsville where there are empty and picturesque brick factory buildings from an era of axe production. On the way to Collinsville, we pass through Unionville–a trolly used to run out here from Hartford where bicycles were once manufactured and where insurance companies took a solid and lasting hold. To get from Unionville to Collinsville, we take a slight left off of Huckleberry Hill and on to New Road which heads down towards a river, the Farmington River, and then follows along there for awhile. Just before the turn on to New Road is a large headstone with my family’s last name engraved upon it. This is where my grandparents are buried. My uncle’s ashes were spread near, and into, the river across the road and at the bottom of the hill. He died in his fifties of a brain tumor. The house that my father’s family abandoned because of a great flood many years ago is somewhere through the trees and on the opposite bank of the water’s edge. All of this at that junction of New Road and Huckleberry Hill. These landmarks pass by in a matter of minutes as I am riding with friends or alone, chatting or just pedaling depending on the day or the hour. New Road was probably new sometime after that flood that destroyed my father’s childhood home over 50 years ago now. Yet I never knew of it and never had quite this clear path through my family’s history or a means of passing through it without feeling weighed down by all of it. The bicycle offers one a different way of seeing things. Constantly. We all know that every ride is different, no second of pushing oneself forward on the bike can be repeated, just like time passing. Always new. Maybe familiar at times, but always new. The invention of the bicycle keeps a promise of inventiveness for me. Its history of changing life also has a promise of keeping life changing. The grave, the house flooded a long time ago, the old road that is marked as new, these are squarely at that intersection where I ride. But a new ride, and new road, await me everyday. 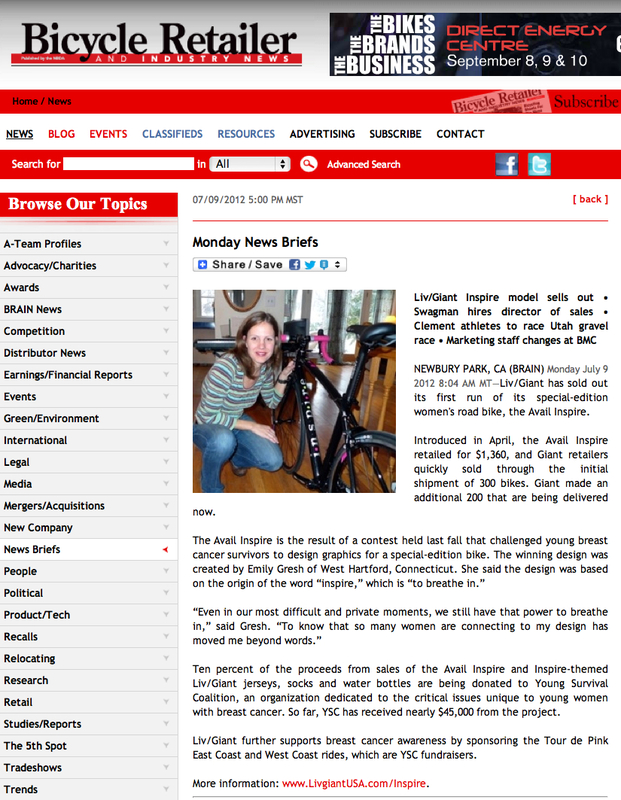 Emily Gresh wears many hats—Trinity alumna, Yale graduate school alumna, dancer, writer, mother, fund-raising professional, and most recently, cancer survivor and the creator of the winning design for Giant Bicycles limited edition bicycle, the Liv/giant ‘Avail Inspire.’ Following an eight year career as a professional ballet dancer at Boston Ballet where she rose to the rank of soloist, Gresh came to Trinity as an IDP student where she earned an undergraduate degree in English and a minor in sociology. From there, she completed a master’s degree in Theater Management at Yale University before entering the workforce in a new field, when she returned to Trinity to serve as the College’s Associate Director of Corporate and Foundation Relations in the Advancement Division. Most recently, Gresh found the brighter side of a diagnosis of breast cancer, at age 39. We sat down with Gresh, to hear more about how she designed the bicycle, its inspirational theme, and her experience as a young survivor of cancer. TC: When you were diagnosed, how did you handle the news, emotionally and physically? EG: There is truly no way to prepare for the news that you have cancer, especially when you feel you are young and healthy and still outside of the reach of that kind of devastating illness. When I was sitting in the doctor’s office at Yale-New Haven Hospital where I was diagnosed and treated, my ears literally closed and I stopped hearing. I did not want to take in that news. It took time to fully absorb it, many days and weeks, and was unbelievably difficult. I had just turned 39. Most women haven’t even had their first mammogram at age 39 and there I was already being diagnosed with early stage breast cancer. Fortunately, I went home and went online and within a few days found the Young Survival Coalition (YSC) website which helped me enormously. TC: What was the most important way that this group helped you? EG: When I found the Young Survival Coalition online, I saw photos of young women participating in the Tour de Pink —a three day, two hundred mile bicycle ride that benefits YSC—and it was like looking into the eyes of people like me who had been where I was going. Breast cancer is not common in women under 40 although obviously it can and does happen, as it did with me. I had to do some searching in order to find my similar aged peers facing this disease. The Young Survival Coalition brings women who are diagnosed on the young side, and their friends and family members together, and that was crucial in keeping me from feeling isolated and alone as I came to terms with my diagnosis and treatment. I could see and figure out from the photos of the bicycling going on in the Tour de Pink that both the training beforehand and the rides themselves were avenues to renewed strength on many, many levels. 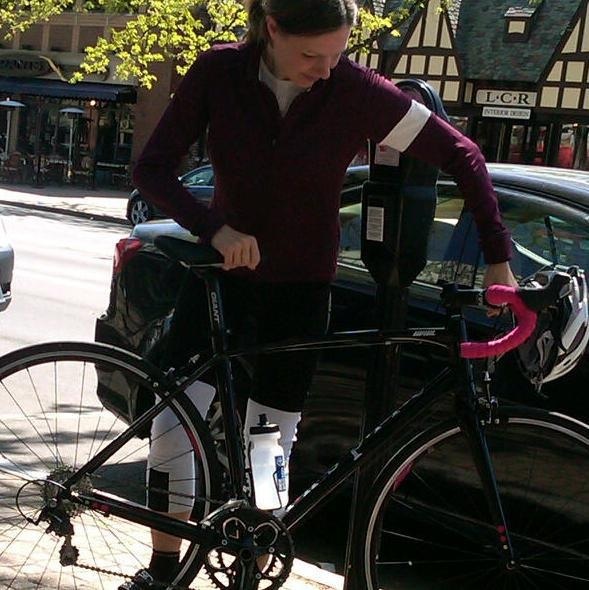 TC: How often did you train for the Tour de Pink, and what was your bicycling experience before then? What were some of the struggles and triumphs you faced along the way? EG: My bicycling experience was limited to that of commuting around Boston by bicycle during my twenties. I started training for the Tour de Pink by doing loops around a pond near my house on a very heavy bicycle. My rides gradually lengthened from a few miles to rides of 60 miles, and I began riding a real road bike, too. 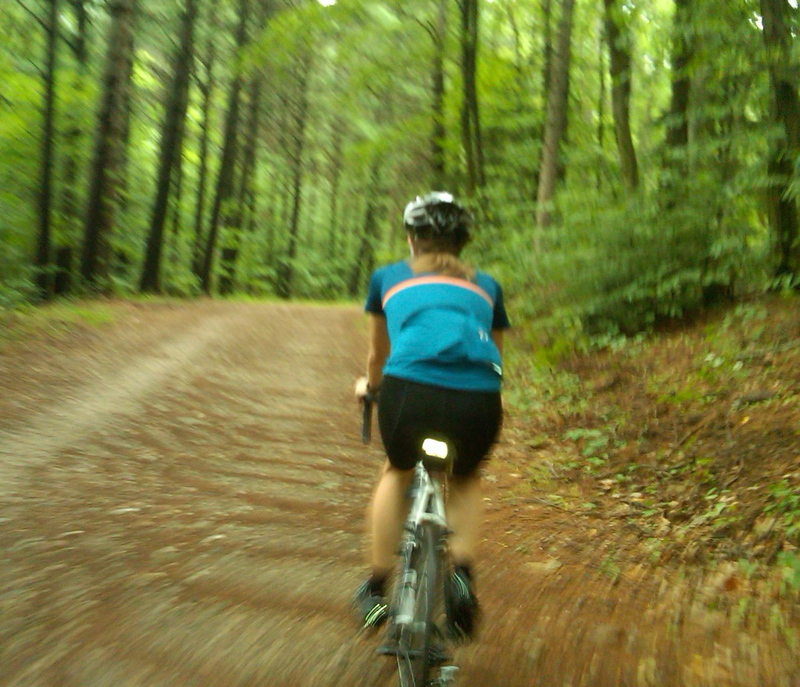 While I was training, there were rides in the rain and also rides in intense summer heat, but it was never a struggle. I enjoyed every second of training and a passion for cycling definitely took hold in me. 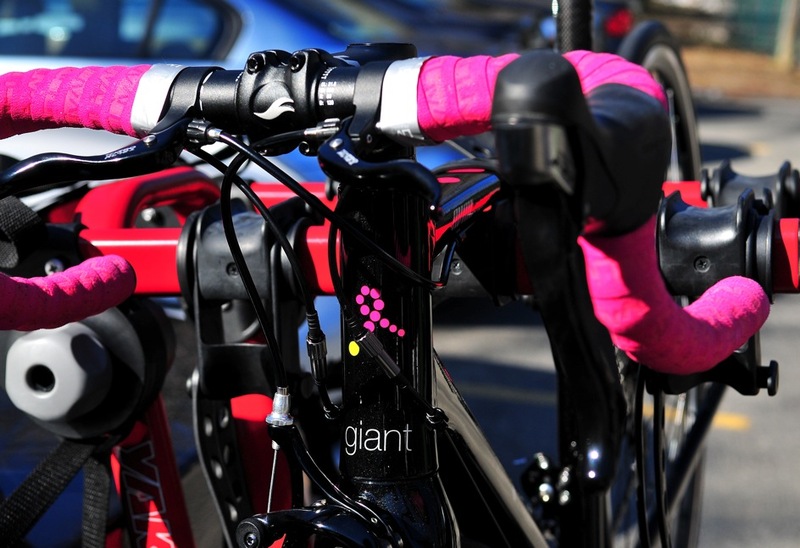 TC: At the Tour de Pink, you learned about a contest to design a new bicycle for Giant, which would be designed specifically for this event, and for young cancer survivors like yourself. What inspired you to enter, and what did the contest entail? EG: When I learned about the contest, I knew it was something I wanted to do. The creative and inspiring nature of the project seemed like the perfect combination for me. TC: When Giant notified you that you had won the contest and that your design would be produced, what was your reaction? TC: What inspired the name “Inspire” for the bike? EG: The late Trinity Professor Hugh Ogden is the person who first pointed out the origin of the word inspire to me. Technically, inspire comes from “to breathe upon” as opposed to “to breathe in.” The notion of breathing in, getting one’s breath back, and the wonderful breathtaking qualities that are found in everyday living became important as I thought about creating a bike that could embody survivorship as well as the possibilities of life. This concept is captured by having the word “inspire” on the bicycle and the word is the main design feature. I will never forget Hugh walking into a poetry class one day and uttering: “People always say they can’t find inspiration. All you need to do is breathe in. The word inspire comes from ‘to breathe in.’ Inspiration is all around us.” For me, it was in that moment that “inspire” took on a more luminous meaning. It has guided me often. Watch a video by Giant Bicycle about Gresh and her bicycle design. TC: You have been chosen as the speaker at this year’s Relay for Life at Trinity. As a young cancer survivor, what is the best piece of advice you would give someone facing the same diagnosis? EG: Inspire, breathe in. Be patient with yourself and others and know your experience as only you can. TC: Earlier in your life, you were a professional dancer with Boston Ballet, one of the top ballet companies in the world. Did this play a role in your battle with cancer, emotionally or physically? EG: My former life as a dancer constantly plays a role in my life today. As far as cancer goes, I knew—and my friends reminded me—that I could not be at war with my dancer’s body. I didn’t think of cancer as a battle. It was a nightmare but not a battle. There was nothing to fight, only things to be endured. TC: You graduated from Trinity’s Individualized Degree Program (IDP), and now work here at Trinity. How has your experience at Trinity helped or affected your life? EG: Trinity gave me the ability to look at language and expression from multiple perspectives. When I had to think about how to make a bicycle express something, I drew upon many of the things I thought about while studying creative writing with the late Fred Pfeil and literature with Chloe Wheatley at Trinity—a text can be read in many ways, so can a dancer’s body, or a patient’s. Why not a bicycle? TC: What is the main difference between Emily Gresh pre-diagnosis and Emily Gresh today? EG: I like to think that cancer did not change me but the truth is that it changed me immeasurably. Every day always mattered to me. But now, every day matters even more. There is only a one percent chance of a recurrence of my breast cancer, but I have known so many people who have had their cancer return. I live every day to its fullest and let myself trust each great moment as it arrives more than I ever did before. It’s exquisite. I am enjoying life very much, I have to say. Emily Gresh will be sharing her story live at the 2012 Trinity Relay for Life, on Friday, April 27 at the Koeppel Community Sports Center at Trinity College. For more on RFL, visit: http://bit.ly/JpLMyn. Proceeds from the purchase of Avail Inspire bicycles, available through Giant Bicycles, will benefit the Young Survival Coalition. A list of retailers can be found here: http://bit.ly/J6YruB. From mind to hand–the essence of handmade–is such a short distance. It is this: a little breaking sound of dawn, not just light slipping across floorboards and through the edges of window blinds and curtains, but a true arrival. It is a fiercer light breaking across the morning as if arriving by wagon over stones, the sound of cyclists preparing for an early morning ride, cleats over rocks. This is the noise that would have you looking up from whatever it was you were doing, knowing that something was happening in addition to just the day’s beginning. From there, you might swing your legs to the edge of your bed and then the floor, or maybe you would be getting up from the kitchen table to open those same blinds or push your front door ajar to see what is that sound; in your bedroom, after your feet hit the coolness of the floor’s surface, your hands probably reach to open the window’s shades or push the curtains aside, the impulse drawing you from sleep towards sound and whatever it is that seems to be out there. The day is handmade now, pulling back that curtain, rising from your bed. You begin to shape it right there. The day is as handmade as the steel bicycle, and the hands are nothing, as Dario Pegoretti, bicycle maker of the handmade type, has said, without the mind. There is the same sound to dancers’ running, too, especially twenty-four of us all at once in the bigger ballets, the Swan Lakes and Sleeping Beauties, Paquitas and Don Quixotes, there are always those rushes on stage or off. And all of that running is preceded by hammering and pounding and shaping the hard box of the pointe shoe. No matter how soft the bottom of the shoe, there is still that noise. Twenty-four corps de ballet women, twenty-four pairs of carefully prepared shoes, feet upon the floor pounding but as muffled as humanly possible, as technically achievable with those papery, satiny, boxy shoes. Inside the shoe, whether cyclist or dancer, is the wonder of the human foot, beneath the asphalt where the cyclist is standing is the earth, off the dancer’s stage, the grass. Earlier, somewhere, the day was beginning for each, the walk across the floor, to the window or down the hall to the kitchen, the coolness beneath their feet. Earlier, their days began with thinking, each inclined to take that possibility of moving from bed to window to out the door a layer further, and each inclined to make the day, the bicycle, the dancer, the body, as alive as possible as they work the hours of their lives through their hands.